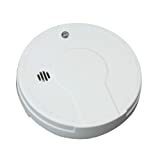 The modern smoke detectors that we have in our homes today may not be something we think about often, but at one time, these were considered a modern marvel. Though we often take these devices for granted, their effectiveness cannot be denied. They have a fascinating history, and we will discuss this further within the scope of this article. 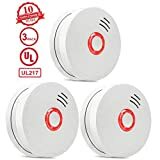 Smoke detectors reduce fire deaths from 0.53 per 100 house fires as compared to 1.18 deaths per 100 house fires in those without fire alarms. — The U.S. National Fire Protection Association. Like with many inventions, there were several people nearing the finish line on crafting this innovation at around the same time as one another. An associate of Thomas Edison’s, Francis Robbins Upton was the first to patent the electric fire alarm in 1890, and in 1892, George Andrew Darby of Birmingham, England patented a mechanism that would detect heat. These machines functioned more or less unimproved until an accidental discovery in the 1930s by Walter Jaeger of Switzerland. The physicist was attempting to create a sensor to detect poison gas by binding to ionized air molecules and triggering a response in the machine’s electrical current. His intended purpose was never realized, as the instrument used for detecting the gas was not sensitive enough to be alerted to its presence. Jaeger lit a cigarette to release his frustrations and noticed a drop in the reading of electrical current, meaning that the machine was able to detect smoke in the way he had intended for it to do with poison gas — and the modern smoke detector was born. This apparatus was further honed by Ernst Meili in 1939 when he designed an ionization chamber that could reveal the existence of combustible gases in mine shafts. He then fashioned a cold cathode tube that could carry the signal in such a way as to sound a loud alarm. 3 out of every 5 deaths occur where there is no smoke alarm. 24% of smoke detector failures are caused by dead batteries. Fire alarms sounded in half of all fires later reported to fire departments. 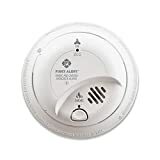 Smoke detectors are a vital component to keeping your family safe, and it is important to keep your loved ones protected in other ways as well. A home security system is essential to this end, as it is a vital way to safeguard your property, belongings, spouse, and children. It is advised that you go with a monitored home security system over using the non-monitored variety, and Protect America can walk you through the installation process. Contact Protect America to get a free quote and to discuss your home security needs today!